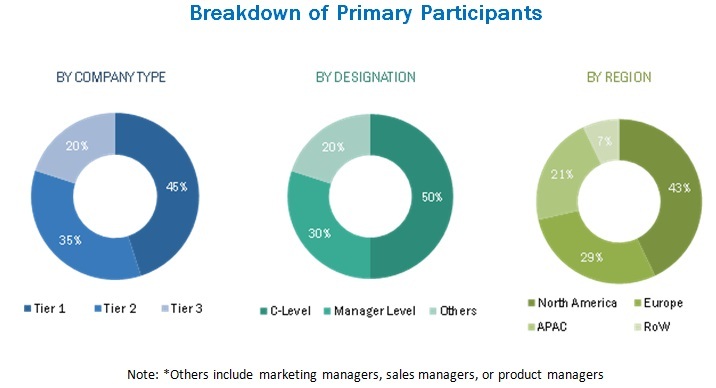 [168 Pages Report] The automation testing market size is expected to grow from USD 7.55 billion in 2017 to USD 19.27 billion by 2023, at a Compound Annual Growth Rate (CAGR) of 17.7% during the forecast period. Automation testing is the process that uses software tools and the power of machine to control the execution of tests and compare their outcomes. The main objective of automation testing is to simplify efforts as much as possible with a minimum set of scripts. Automated tests provide constant results and data points. The main benefits are ease of maintenance, the ability to efficiently use resources during off-peak hours, and the capability to create reports based on executed tests. Additionally, automation testing along with smart analytics, is expected to become crucial for testing, as it enables the automatic adoption of test suites, intelligent decision-making, and fast validation. The space of test automation has grown from simple automation of test activities to automation of test data and test environments. The emergence of smarter products and smarter applications has also generated the demand for intelligent, integrated, and automated testing of these constantly changing products and business environments. The base year considered for the study is 2017 and the forecast period is from 2018 to 2023. The use of mobile devices has been transformed from a communication tool to a multipurpose gadget, which can also be used for business needs. According to a survey conducted by GSMA Mobile Economy, there would be 5.8 billion smartphones globally by 2020. Owing to the rapid increase in mobile penetration, related testing activities, such as mobile application testing, mobile automation Appium, and mobile automation Selendroid, are also expected to increase. Technological advancements and the proliferation of these devices across operating systems (Apple iOS, Android, and Windows mobile) and platforms have made it more challenging for hardware manufacturers and application developers to develop and roll out new products. According to the World Quality Report 2017–2018, various organizations have claimed that the time taken to test mobile applications has increased over the last 3 years, from 36% in 2015 to 52% in 2017. The DevOps model of software development is becoming the main pillar of digital transformation. The model eliminates traditional silos of businesses, IT development, QA, and IT operations, and helps organizations in adopting the methodology, from software development to the deployment phase. According to the World Quality Report 2017–2018, the use of DevOps in projects has increased from 7% in 2015 to 47% in 2017. This increase is evident by the fact that organizations such as IBM have focused strongly on including agile and DevOps methodologies in their software project model. Recently, IBM faced challenges in its Collaborative Lifecycle Management (CLM) software, as the new updates of the software were released once a year. However, the company realized that such a long release of the software update is inadequate to meet the fast-changing market needs. Later, the company moved to the continuous delivery model, including DevOps, where the product update would be released quarterly, which would include both major and minor changes. As a result of this, the team was able to deliver updates every 12th week; moreover, the time taken to test these updates decreased to 2–3 weeks by automating deployment of the test environment. Test automation is seen as a way to reduce testing costs, increase test coverage, and shorten testing cycles. It provides benefits in terms of RoI with regard to reduction in Operational Expenditure (OPEX) and Capital Expenditure (CAPEX) as well as incremental revenues. Automation testing involves higher upfront cost and should be looked at as a long-term investment where the pay-offs come anywhere between 1 and 3 years. Every organization calculates and estimates their RoI, and understands factors, such as time to develop scripts, time to analyze the results manually and automatically, purchasing and licensing cost of tools, time and cost to train resources, time to maintain scripts, and management overhead, which would influence and enhance their investment and help them get the best out of automation. For example, a manual tester runs tests 8 hours a day and then goes home, during which the testing stops. With test automation, the tester can run tests 16 more hours a day for the same cost, thereby reducing the average cost of testing hours. The automation testing market includes various vendors providing automation testing solutions and services to commercial clients across the globe. The companies, such as IBM (US), CA Technologies (US), Micro Focus (UK), Capgemini (France), Microsoft (US), Tricentis (Austria), SmartBear Software (US), Parasoft (US), Cigniti Technologies (India), Ranorex (Austria), and TestPlant (UK) have adopted partnerships, agreements, and collaborations as the key strategies to enhance their market reach. In November 2017, CA Technologies announced an expanded portfolio that enables IT enterprises to integrate security into the earliest stages of development, and assures security in deployment, which is an emerging practice known as DevSecOps. This expanded portfolio supports further integration with CA Automic Application Release Automation to enable faster deployment capabilities with an automated, agile back-end that delivers more reliable releases of the code. In September 2017, Micro Focus introduced significant automation advancements to the Fortify application security portfolio that empowers developers, testers, and operations teams to implement security testing and remediation at a faster rate. The updated portfolio is fully integrated into DevOps toolchain with enhanced automation capabilities. In March 2017, Microsoft partnered with Parasoft, one of the leading providers of innovative tools that automate time-consuming testing tasks. This partnership enabled Parasoft to develop automation testing solutions, such as API testing and service virtualization, for Microsoft’s Visual Studio eEnterprise subscribers. The global automation testing market size to grow from USD 8.52 billion in 2018 to USD 19.27 billion by 2023, at a Compound Annual Growth Rate (CAGR) of 17.7% during the forecast period. The major factors that are expected to drive the growth of the automation testing market include the increasing adoption of mobile devices and technologies, increasing adoption of the DevOps methodology, and transforming testing by digital transformation. In addition, the automation testing increasing returns on investment are expected to boost the market growth. Automated testing involves different types of testing, such as functional and non-functional testing, used to automate testing scripts by running those scripts frequently. The functional automation testing deals with the functionality of applications on different endpoint interfaces, such as web, mobile, and desktops. This functional testing of a software is conducted on a complete, integrated system to evaluate the system's compliance with its specified requirements. Additionally, functional testing embraces the testing of interaction between devices, valid calculations, error handling, and basic device testing, required for the performance of Social, Mobile, Analytics and Cloud (SMAC) technology-based applications. The nonfunctional testing, on the other hand, involves testing of a software from the requirements that are nonfunctional in nature, such as performance, security, compatibility, compliance, usability, load, and stress. Non-functional requirements majorly focus on the product quality, particularly in context with the suitability perspective of users. 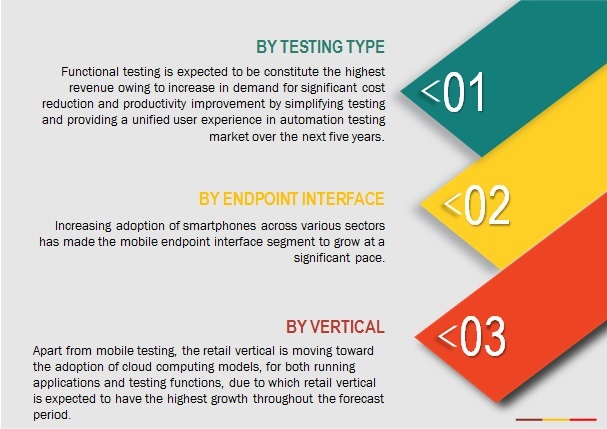 The mobile sub segment is expected to account for the highest CAGR in the endpoint interface segment attributed to the fact that Test automation is important for mobility testing as the same use case has to be run and validated on a growing number of devices and platforms. A reusable and scalable automation solution can help optimize the test effort. This significantly reduces the time required for testing and also the cost of testing. Automation testing providers offer different solutions and services that support various mobile endpoint interfaces, such as mobile application consultancy, Android, iOS, Windows, hybrid, cross-platform mobile app development, and support and maintenance services. Furthermore, automation testing for mobile interfaces helps reduce the length of testing type and overall test analysis cost, ensures compatibility of applications with independent nature of IT devices, and finally ensures the application quality by identifying possible performance and security glitches. The automation testing market in APAC is expected to grow at the highest CAGR during the forecast period. 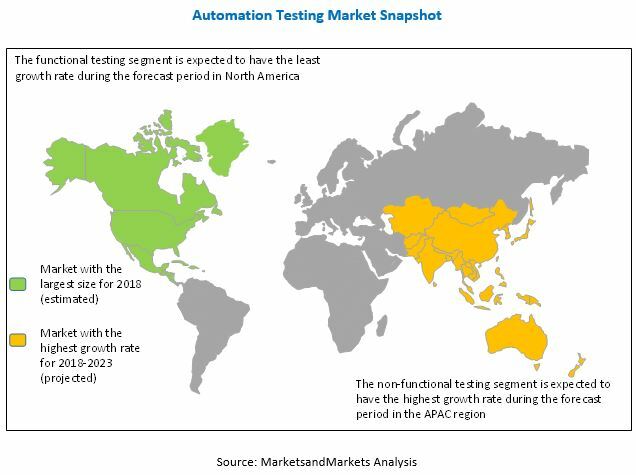 Asia-Pacific (APAC) is expected to grow at the highest CAGR during the forecast period which is attributed to the fact that it is witnessing dynamic changes in the adoption of automation in testing activities across multiple verticals. Mobile development, quality and testing maturity, and agile methodology adoption are the major areas where companies in the region are increasing their investments. The mobile technology is said to witness a robust growth rate, as the adoption of smartphones is on a steep rise in the APAC region. Test automation is important for mobility testing as the same use case has to be run and validated on a growing number of devices and platforms. A reusable and scalable automation solution can help optimize the test effort. This significantly reduces the time required for testing and also the cost of testing. Automation testing providers offer different solutions and services that support various mobile endpoint interfaces, such as mobile application consultancy, Android, iOS, Windows, hybrid, cross-platform mobile app development, and support and maintenance services. Furthermore, automation testing for mobile interfaces helps reduce the length of testing type and overall test analysis cost, ensures compatibility of applications with independent nature of IT devices, and finally ensures the application quality by identifying possible performance and security glitches. Automated testing of applications on web interfaces includes testing of web applications to ensure that they are functionally correct, reliable, and scalable, to improve their performance with varying user load. It involves testing both the client and server-side components of the web application. Automation testing of web applications involves testing of the front-end or UI of web applications running in web browsers. Moreover, automation testing includes automating manual testing tasks, which are mostly time-consuming and error-prone. This testing type is more accurate, efficient, reliable, and cost-effective as compared to manual testing. Automation testing for desktop endpoint interfaces includes cross-device and parallel testing, and unified integrations with the existing tool environment. Furthermore, it helps in simultaneously testing desktop applications in multiple environments with different system configurations, application versions under test, and operating systems. Moreover, this automation helps counteract constraints in resources, shortens release cycles, and increases efficiency, thereby leading to a higher RoI. Additionally, it helps build automation test cases for any virtual desktop application. What are the upcoming types of functional and non-functional testing for automation testing? Data protection and privacy concerns are expected to be the major restraining factor for the growth of the automation testing market. Ensuring the privacy of the customer during testing has always been the major issue. Failure of organizations to meet data security compliance requirements can eventually result in penalties, which can impact the business to such an extent where recovery might be impossible. The recent data breach investigative report, published by Verizon, forecasts the average loss for a breach of 1,000 records between USD 52,000 and USD 87,000. To stop this kind of breaches, governments of different countries are taking necessary steps. For example, in Europe, European Union’s (EU’s) General Data Protection Regulation (GDPR) is expected to come into force in May 2018, and would be applicable for all companies operating under EU. However, the recent developments, such as new product launches and acquisitions, undertaken by the major market players are expected to boost the automation testing market growth. The study measures and evaluates the major offerings and key strategies of the key market vendors, including IBM (US), CA Technologies (US), Micro Focus (UK), Capgemini (France), Microsoft (US), Tricentis (Austria), SmartBear Software (US), Parasoft (US), Cigniti Technologies (India), Ranorex (Austria), and TestPlant (UK). These companies have been at the forefront in offering reliable automation testing to commercial clients across diverse locations.